The Airbus double-decker, wide body aircraft was re-routed as it passed over Greenland, landing in Goose Bay in eastern Canada at 1542 GMT, the spokesman said. 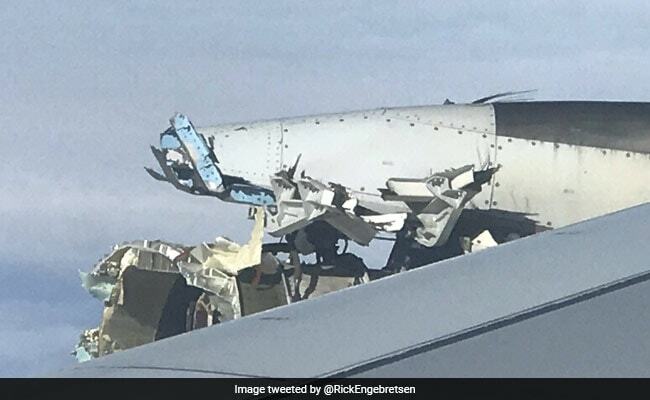 An Air France A380 superjumbo carrying more than 500 people made an emergency landing in Canada on Saturday after suffering "serious damage" to one of its engines, with passengers recounting hearing a loud bang followed by violent shaking. Passenger Sarah Eamigh told Canadian broadcaster CBC News she heard a "boom" followed by a sudden drop in altitude. "The cabin started vibrating. Someone screamed, and from there we knew something was wrong," she said. "We saw the cabin crew walking through the aisles quickly, and we heard an announcement from the captain that said one of our engines had an explosion." "All of the 520 people on board were evacuated with no injuries," the spokesman told AFP. Rehmar said that for a few moments, he thought "we were going to go down". "We were just stretching and talking, and suddenly there was an enormous bang, and the whole plane shook," Birkhead, 59, said. "We were lucky we weren't tossed to the ground." "Engine failure halfway over the Atlantic ocean," he wrote. Passenger Pamela Adams said everything on the flight had been normal "and suddenly it felt like we had run into a jeep in the middle of 35,000 feet high", she told CBC News. She said she was "jostled" and the plane dipped slightly "but the pilots recovered beautifully". "There wasn't the panic that I would've expected," she said, praising the pilots for the way they handled the incident.